Thoughts on the iOS app size increases. I have seen a few articles floating around this past week since ABI Research announced their report findings that iOS app size has increased 16% over the past 6 months and game size increased 42%. Download Limits can lose sales: iOS is hardcoded to have a 50mb download limit unless connected to a wifi network. When targeting a mobile device, you want mobile users to be able to purchase your app. Many times I have had the 'Connect to wifi to download' error and forgotten to download the app when on wifi. Device Storage Limits: I remember when I first tried to download Infinity Blade and found out I had run out of space so the App Store would not let me complete the process. Again, a potential sale loss. The Inevitable App Cull: Every so often, I open the usage option within iOS settings and check what is hogging up my space. Rarely would I scroll to the bottom of the list and remove the multiple 10-50MB apps, I would remove the large offenders at the top of the list that eat 100s of megabytes and in some cases gigabytes of space. With the above in mind, I decided to have a look at my app Joke Shake, which supports all current iOS devices and I was quite surprised. The app weighs in at just over 9MB which is quite small compared to most apps and hits the 3 points above. It can be downloaded via cellular network, most people would have enough space to house it and it would hide from users trying to cull their apps as it will be right at the bottom of the list of space offenders. You can see the distribution of the space eaten up by image files in the Pie Chart to the right. How much space do image files take up? Could my app be smaller? The simple answer is yes. On my 9MB app, over half of that is dedicated to image files, 4.7MB in total. When you download this app, it includes the graphical assets for iPhone, iPhone Retina, iPad & iPad Retina. 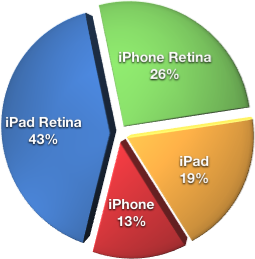 69% of the space taken by image files is taken up by assets to support the higher resolutions of the retina devices. For users running my app on an iPhone 3GS, out of the total 4.7MB of graphics, only 0.62MB is required. Would the larger apps follow this kind of trend, offering 30-46% savings if unused assets were stripped out of the apps?